My mom grew up in Grand Forks, BC, where she spent an idyllic childhood. It’s always been a special stop on the way to Nelson, which is where my Grandparents retired until they both passed away. Recently we stopped in Grand Forks on our way to a family memorial gathering at Christina Lake. To visit Grand Forks is to set foot in a true small town – charming, bustling, and filled with character. Sitting at the junction of the Kettle and Grandby Rivers, about 500 km from Vancouver, Grand Forks was established at the turn of the last century and became a booming mining-fed economy. Although the town suffered a downturn after CP closed the railway in 1991, today Grand Forks is home to about 4,000 people with 10,000 more living in the surrounding area. If you leave Vancouver at around 7 in the morning, and take the Hope-Princeton Highway*, you’ll make it to Grand Forks for a late lunch**. On this specific trip, we barreled through a couple of our usual stops, and were making good time. The rented family van was filled with my husband, my brother, my mother, and my daughter (plus various totes and coolers of camping gear), twisting and winding our way to the little town famous for its Doukhobor population and general friendliness. We rounded the corner and … she was right. I took some pictures with my phone, but the van was moving at quite a clip. It doesn’t quite justify it. “It’s just so pretty,” she added. After a few moments of quiet (rare in our family), my brother piped up from the front seat. “When you were a girl, did you run around the mountainside, singing ‘the hills are alive with the sound of music?’,” he asked. The moment well and truly gone, we drove slowly through town, and stopped at the Omega Restaurant. You’ll be happy to know that the town itself proved to be rattlesnake free! The Omega is a family-style place specializing in home-cooked Russian (and Doukhobor) food. Everything we tried (right down to the key lime pie) was worth the wait. So it you’re looking for charm, borscht, and delicious pie, make a stop in Grand Forks and you’ll be glad you did. Just watch them hills! 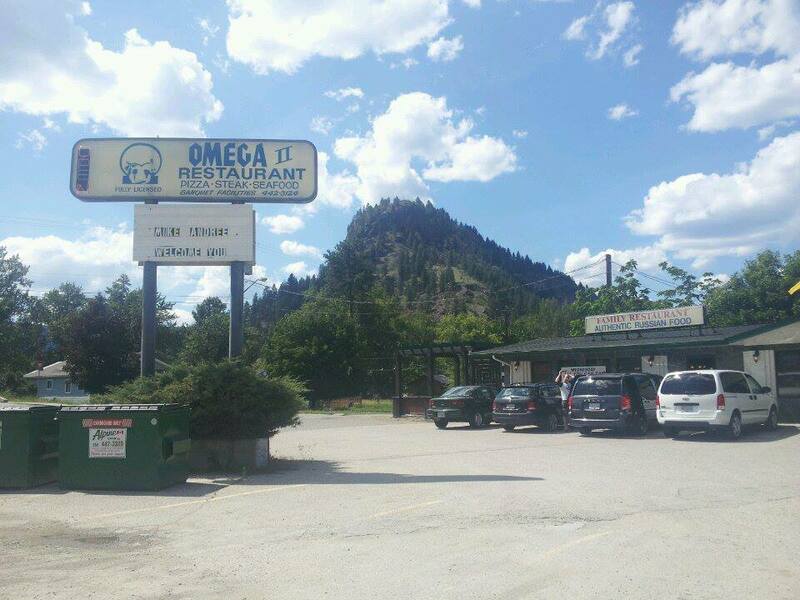 Omega Restaurant has some of the best pie in BC! *Disclaimer: this is ONLY true if you travel via the Hope-Princeton Highway (3A), rather than the Coquihalla. We recommend skipping “The Coke” en route to the Kootenays for scenic reasons and because of the ways the stops are spread out. The road is very twisty, however. If you have small children (even if they are not prone to carsickness) you may find they get nauseous. See here for more on our experience with that. ** If it’s your first time in the area, we recommend stopping for a latte or drip coffee at at Deadwood Junction in Greenwood. Perhaps rivaling Grand Forks for character and cuteness, Greenwood is Canada’s smallest city and has some of the world’s most delicious drinking water. Deadwood Junction has amazing coffee and treats, clean washrooms, a grassy patch for kids to run around (dogs too, just keep it tidy), and a charming gift shop. In the summer they fire up a barbeque and serve homemade fast food favourites. 2 thoughts on "The Hills Are Alive with the Sound of … Rattlesnakes"
Yes, there are rattlesnakes here, I live in Grand Forks and while it’s not common to see them, they are here and many people have encountered them and some people have been bitten, they have the anti-venom medicine at the hospital for fast treatment. The library also has experts come in to talk about the snakes, in BC they are a protected species and you are not allowed to kill them. Most of the snakes stay in certain areas, such as at the landfill and south facing hills, and there is actually a sign posted at the dump that warns they are in the area, and they can travel up to 3 kms for water, creepy! !